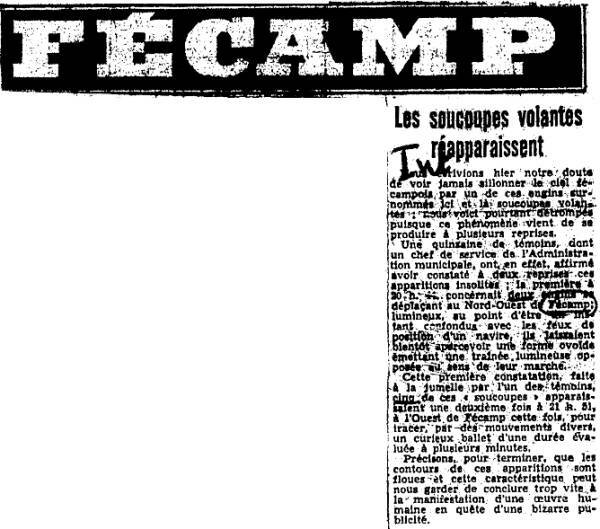 Reference number for this case: 28-Sep-54-Fécamp. Thank you for including this reference number in any correspondence with me regarding this case. About fifteen witnesses, among them the head of department of the Municipal administration, indeed, affirmed to have noted twice these strange appearances; the first at 08:[??] p.m. related to two machines moving in the North-West of Fécamp: luminous, at the point of beings confused with the navigation lights of a ship, they soon let see an ovoid shape emitting a luminous trail opposite their direction of movement. This first observation made with the binocular by one of the witnesses, five of these "saucers" appeared a second time at 09:51 p.m., in the West of Fécamp this time, to trace, by various movements, a curious dance whose duration was evaluated as of several minutes. Let us specify, to finish, that the contours of these appearances are fuzzy and this characteristic prevents us to conclude too quickly that it is the display of some human work in search for bizarre publicity. 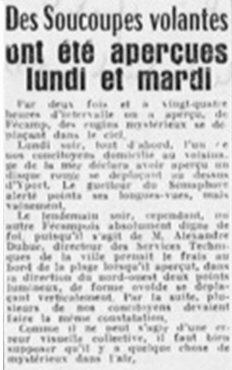 [pn1] Article in the regional newspaper Paris-Normandie, Rouen, France, October 1, 1954.